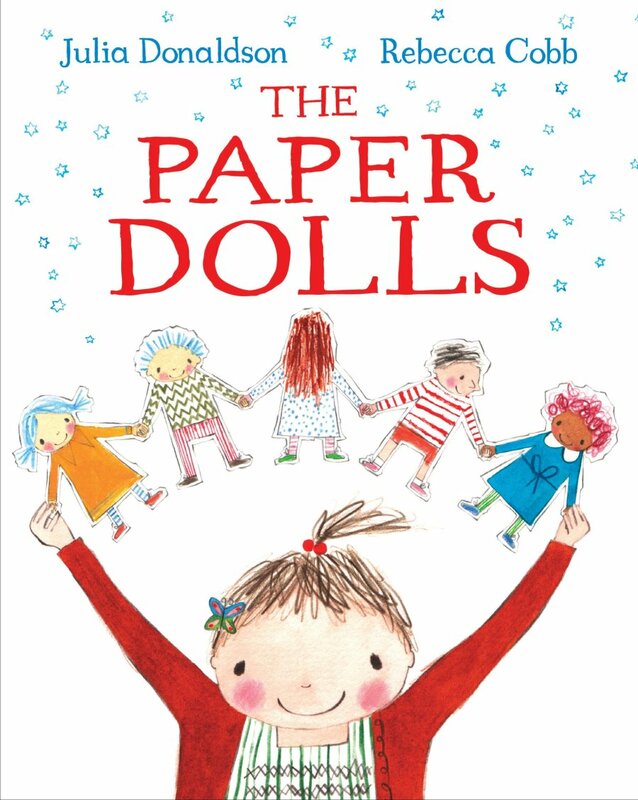 The breathtakingly beautiful story of one little girl and her six paper dolls. 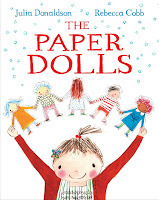 A string of paper dolls go on a fantastical adventure through the house and out into the garden. They soon escape the clutches of the toy dinosaur and the snapping jaws of the oven-glove crocodile, but then a very real pair of scissors threatens. Fans of Julia Donaldson will rejoice that she has a new book out, a great book to share with the little people in your life. It’s a story about imagination and memories and the joys of being young. It’s a book that will make parents and adults think back to the things that made them happy when they were young. I am also a fan of Rebecca Cobb, after reading her wonderful Missing Mummy and Lunchtime (which I didn’t write about), so the pairing of two stars is a real treat for me. ‘You can’t get us. Oh no no no! We’re holding hands and we won’t let go. The come across a dinosaur, a tiger, a crocodile and they manage to escape them all. The one thing they didn’t expect was a boy…a boy with scissors. With a snip snip snip, the dolls are gone, tiny pieces fluttering in the wind. This may sound like a horrible end to a story rich with imagination and fun, but what happens next is what makes this book so special. All of those little pieces flew through the air and ended up in the little girls’ memory, where they stayed with her and all of her other memories of fireworks, a starfish soap and a kind granny. Those memories stayed with her as she grew and grew, until one day she was a mother who made paper dolls with her own little girl. There will probably be people out there who think this book is a little sentimental, and maybe it is, but I think it will still appeal to younger readers. Children are fascinated by the fact that their parents and other adults were children once too, and that will be the thing that makes this book perfect for parents to share. It may not be paper dolls that you remember, it might be sandcastles, magic shows or picnics, but we all have some special memories from our childhood that we want to share with the children in our lives.